They didn't run the lift but it looks like for those willing to hike there was June skiing despite one of the worst winters ever. I'm always entertained by the summer defying shenanigans at Killington. Okay, time to bump this. We've sort of made it our mission this year to learn to ski, and while it's a process we're slowly improving. We're not quite parallel yet but we're definitely improving steadily. This is not an easy sport to learn by any stretch, but we're absolutely loving every minute of it. 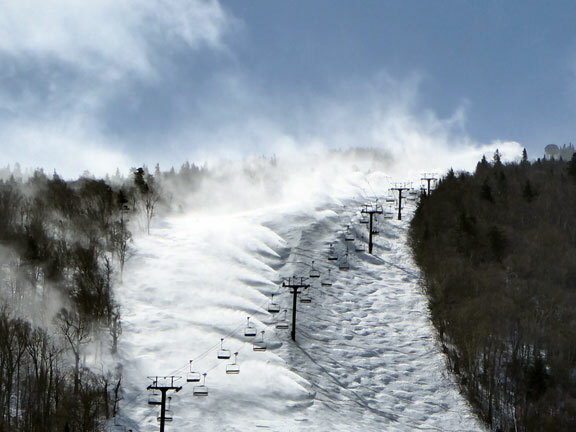 This season was looking like a bust weather-wise, with our home mountain (Hunter) fighting to stay open with a pretty impressive amount of March snowmaking but this noreaster should be a real shot in the arm for northeastern Ski areas. Anyone planning on heading out there and taking advantage of this massive storm? Well, yesterday was my last time snowboarding for the season. coasterbill wrote: Okay, time to bump this. Aaah Hunter Mountain. One of my first experiences skiing. But I skied there around the time that Hunter Mt., NY was the "snow-version" of the infamous 'death-by-water' Action Park, NJ! Hunter was a playground for huge tour groups of skiers who'd snap into bindings for the very first time in their lives - and head immediately for the steepest Double Diamonds. (K-2, a winding treacherous trail of sheer ice was their fave first entry into the sport!) And, then there was 'Belt Parkway,' - a fairly narrow intermediate run, the only main drag down to the lodge at day's end. 'Dodge-ems' on skis. Survivors buy the first round! CoasterBill, I sure hope Hunter has gotten their act together these days. It should be a really great home mountain, and the few times I was able to ski it on an uncrowded weekday, I genuinely enjoyed it. Continue to enjoy the learning process - am so glad that you're loving it. For those of us with an Addiction to Adrenaline, (yes, all you TPR coaster fans! ), skiing/boarding is one AMAZING and exhilarating sport. I've now skied around the country and Europe, and there is so much fun ahead of you the more techniques you master. I NEVER stop learning - always something new to conquer! (Would someday love to tackle boarding. My first and solo experience was under the guidance of a real bummer of an instructor. I can still hear her evil chuckles as I slid down the slope face first, breaking my prescription ski goggles! I always swore I'd try again - and heck maybe I will. I suspect that there is a large correlation of Coaster lovers to those who share a passion for Downhill Schussing?!?! An adrenaline rush 12 months a year -what could be bad!? Hunter does seem to have gotten it's act together and it seems like a really nice mountain. One problem we're running into though is that their learning area is excellent but once you graduate from that (which we're close to doing) you have a really limited amount of blues to work with. They have a ton of great learning areas and a ton of expert runs but very little in between. I feel like we'll need to venture out a bit more next season. Sorry for the double post (the thread has been dead), but there's been some big news lately which is kind of surprising since tomorrow is June 1st but it seems like a few resorts are planning on ridiculously long seasons this year. In the east, thanks to a ridiculous snowmaking assault, Killington will be spinning Superstar tomorrow and lift tickets are free. This is the first time a mountain in the eastern US has had lift served skiing in June since 2002. It's patchy but it's top to bottom (and once again... it's free). Meanwhile out west, Arapahoe Basin has extended their season to June 11th and Squaw has hinted at potential year round operation this year. This won't likely happen, but there's a strong chance that they'll be open beyond their traditional 4th of July closing date. Mammoth Mountain is planning on having daily operation into August. It's definitely been a good year for ski resorts in the US (which is a welcome change) and it's nice to see resorts extending their seasons beyond their typical closing dates. If I was within a 4 hour driving distance of that, I'd pack my stuff and head over pronto. That sounds incredible... sketchy, considering patches of grass, but I really wish I could try it! There are at least 3 resorts I know of that are still open out here in California They still have a massive base of snow. They are talking being open until July 4th.